Home» modern technologies » WHAT IS HYDROGEN SUPER HIGHWAY, MAGLEV TRAIN, HYDROGN FUEL CELL AND CONDUIT CLUSTER. WHAT IS HYDROGEN SUPER HIGHWAY, MAGLEV TRAIN, HYDROGN FUEL CELL AND CONDUIT CLUSTER. What is hydrogen super highway? This is probably the most recent and most innovative science in the field of transportation. The principle of magnetic levitation will be used in this system. The energy used for the system is hydrogen energy and solar energy. Hydrogen energy is primary and dominant energy and solar energy is used to treat water to produce the hydrogen energy. That is why it is called hydrogen superhighway. To obtain the hydrogen energy from water by using solar energy the photo voltaic panels are used in the train to get the solar energy. In this the power is mainly produced by hydrogen fuel cells. Other sources of energy are solar energy and magnetic levitation technology. As there is no access of solar energy at night and it is dependent of weather, there is large requirement of energy storage system. So the hydrogen energy needs to be stored. While producing the hydrogen energy, the part of it would be stored. • The speed of the vehicle in the hydrogen super highway would be about 250 miles per hour. • Conduit cluster offers many features. • The clean energy is produced by the system and used by the system so this is very environmental friendly. • In maglev vehicles there is a facility of ‘Auto carriers in which one can carry his own car, or any other automobile vehicle. This technology provides limitless facilities as it has different types of carriers, conduit cluster, and hydrogen energy. maglev or magnetic levitation is a method of suspending an object above a surface without any support. The magnetic field and magnetic force will oppose the gravitational force and made the acceleration of object to be zero and balance all the forces. In maglev trains this principle is used which can be understood by following text. 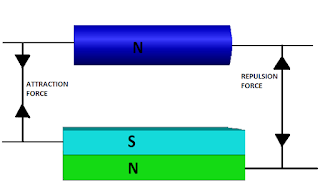 • If the object is of north pole, as shown in figure and it is to be suspended over two magnets, the upper south magnet will attract the object because of opposite poles and the lower magnet of north pole will try to repel the object. So there will be both the forces of attraction and force of repulsion. 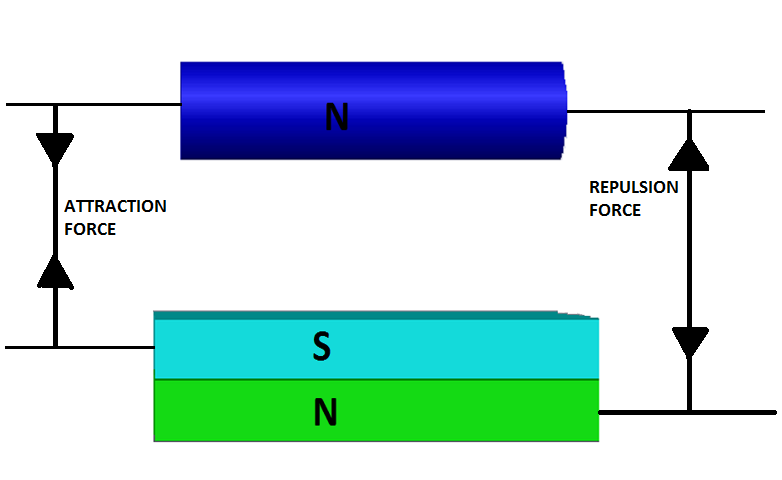 These forces will balance each other and because of this equivalence the object will suspend on above the surface of both the magnets. • By above process of magnetic levitation we can understand that there is a combination of magnets is required or we can say a proper arrangement of magnetic poles is required. Since we are discussing about hydrogen super highway, so we would study the maglev in the context of hydrogen super highway. • In the HSH lot of magnetic arrangement is used. This system will provide suspension guiding, propulsion and lift to the vehicle running on the hydrogen super highway. In the hydrogen fuel cell the generation of hydrogen energy is done. The hydrogen molecules would be to converted it into the hydrogen energy by . In the hydrogen fuel cell the hydrogen is chemical energy from which the useful chemical energy is to be produced. the hydrogen will emit the electron and the hydrogen ion will reach to the oxygen. the emitted electron will flow through a load and that flow of electron will cause the generation of electricity. then the electrons will also reach to the oxygen and produce water by mixing with hydrogen ion and oxygen.